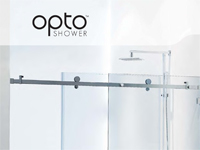 The smart choice for frameless shower screens. All frameless shower screens have been toughened tempered (10mm glass) to Australian safety standards. Ultra high quality, stylish bi-fold doors. Elegant and stylish, bi-fold frameless shower screens provide your bathroom with innovative design and a contemporary look. All doors are made of tempered glass that meet Australian safety standards and are available in variety of colours and finishes to suit your bathroom and budget including left handed configurations. Beautiful stylish, hinged frameless design. Framless hinged shower screens & doors offer flawless function and elegance. 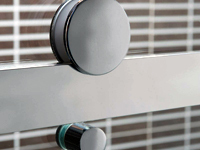 All doors are made of tempered glass that meet Australian safety standards and are available in variety of colours and finishes to suit your bathroom and budget including left handed configurations. Light & versatile, sliding door design. 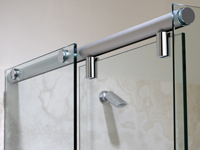 The Hydroslide System can accommodate a wide range of shower designs with fixed glass panels on either end, or both sides at 90 or 180 degrees. The Hydroslide System also accommodates the option of floor-to-near-ceiling glass panels with a sliding door. Simple sliding door system with elegant sophistication. Clean sophistication, minimalist styling & pivot system. Provides an open, light-filtered showering environment with clean sophistication that complements any bathroom decor with its minimalist styling. Custom installation available for door to open to right or left to suit your preference and bathroom. All supplied and installed to Australian safety standards for the glass industry.